Sarah’s Key, directed by Gilles Paquet-Brenner (Pretty Things, Payoff, Walled In), is a powerful study of the impact of the Holocaust on one person’s life. Julia Jarmond (Kristin Scott-Thomas – Four Weddings and a Funeral, Nowhere Boy, Tell No One) is an American journalist living in Paris and married into a well-to-do French Family, with a teenage daughter. About to inherit a flat from her husband’s family, she gradually discovers that the flat has an unpleasant history – that it once belonged to a Jewish family until they were forcibly evicted and rounded-up by officials of the Nazi-collaborationist Vichy regime on 16th July 1942. 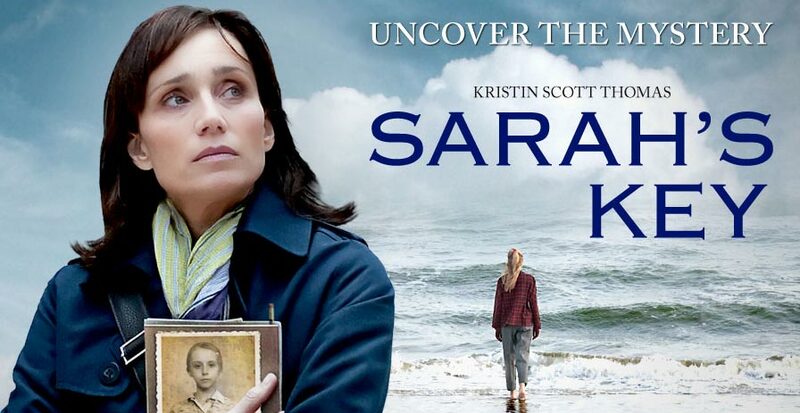 Julia (Kristin Scott-Thomas) make alarming discoveries about the past. The film operates on two narrative levels – Julia’s own revelations in the present, coupled with the fate of that family seen through the eyes of 10 year-old Sarah Starzynski (Melusine Mayance – Ricky). Whereas some films that employ a multi-narrative focus can become confusing to the viewer, skilful editing allows the story here to be told in a straightforward and effective way. Sarah’s story is truly a harrowing one. Before the French police can see them, she locks her younger brother in a bedroom cupboard, taking the key with her and determined to come back. She and her parents are taken to the sports stadium, the Velodrome d’hiver, which for three days became a makeshift concentration camp for thousands of Jews, until they were transferred to other internment facilities. Without operating on a massive budget, Paquet-Brenner allows the viewer to be immersed in this terrible situation, providing a shocking snapshot of life within the ‘Vel d’hiver’ – the appalling sanitary conditions, the lack of space and the awful uncertainty faced by all the internees as they awaited their fate. There is occasional bravery and foolhardiness, as one inmate carries out a daring escape. Sarah’s fate, and the travails she has to endure are also portrayed with a hard-hitting immediacy. She and her parents are transferred to the Beane-la-Rolande camp outside Paris. After being separated from her parents, who are sent unknowingly to Auschwitz, she and another child escape the camp. Sarah finally achieves a kind of freedom. But even in later life, she is haunted by the events of the past. Mayance plays Sarah with enormous charisma – we are totally engrossed in her fate. Charlotte Poutrel who plays Sarah in later life imbues her with both moving dignity and tangible personal trauma. Sarah (Melusine Mayance) in happier times. Meanwhile in the present, Julia faces her own struggles and is forced to re-evaluate her own life as she asks questions that her in-laws would prefer were not asked, representing the general unease felt in some areas of French society about the events of the 1940s.She also faces up to the reality of her unhappy marriage – she becomes pregnant, which her husband, preoccupied by work, is painfully indifferent about. She goes on a personal quest to find out more about the fate of Sarah and her family, which leads her to New York and Italy where she finally meets Sarah’s son, played by Aidan Quinn (Blink, Legends of the Fall, Unknown), who knows little of his mother’s fate. Next year is the 70th anniversary of the round-up of French Jews, which has also prompted another film on the subject, La Rafle (The Round-Up). There, the narrative is squarely based in the 1940s and has more of a documentary-style feel as scenes depicting Hitler and Himmler, and machinations of the Vichy authorities are run alongside the awful fate of the Jewish families. That leads to an informative and disturbing film, but somewhat distant. Here the pain and stoicism Scott-Thomas portrays in her performance provides an intensely personal and unifying emotional core to the film. As the fate of Sarah unfolds for her, so it does for us, staying with us long after the cinema has been left. This entry was posted in Ancient & Historical, Book based, Drama and tagged 1940s, film, film reviews, France, historical, holocaust, Key, Kristen, movie reviews, persecution, review, reviews, round up, Sarah, Sarah's Key, Scott-Thomas. Bookmark the permalink.